collaborate with us so that we can provide critical services to those in need in our communities. Our work is only possible due to the ongoing support of individuals, clubs, businesses, and organizations. Okanagan Fest of Ale “Giving Back” Charity 2017 event. ​Desert Valley Hospice Society received $2,100 for a new telephone system. Pictured left to right: Fest of Ale Rep., DVHS's Vice-President Donna Kelso and Executive Director Donna Gordan. 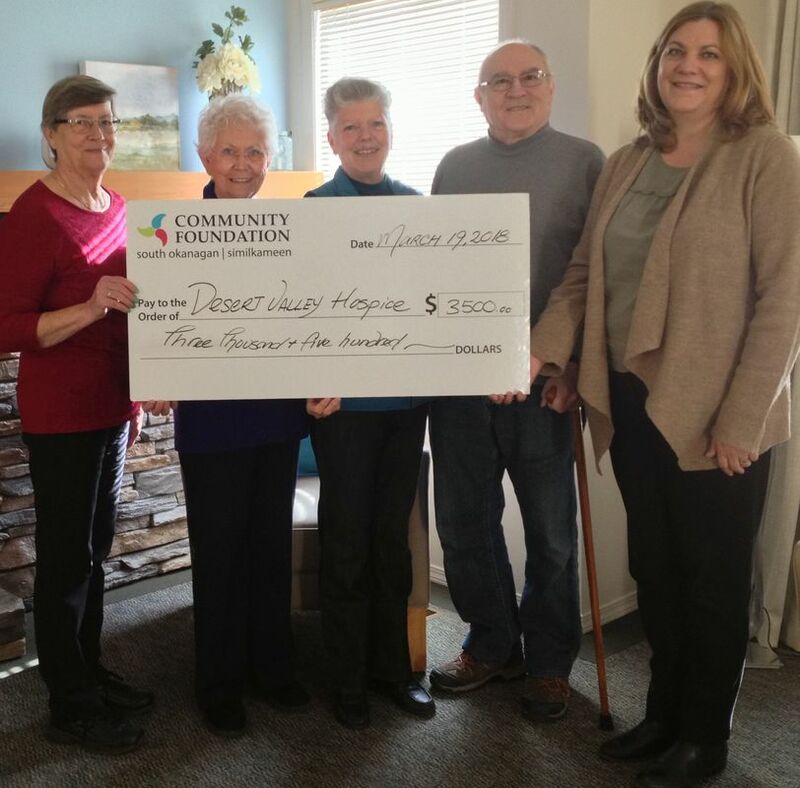 Desert Valley Hospice Society received $7,500 from the Osoyoos Credit Union Community Giving Fund Program for the Supportive Care day Program. Pictured left to right: DVHS's Past-Treasurer Sherry Linn, Executive Director Donna Gordan, OCU General Manager Greg Sol, and Vice-President Donna Kelso. Shoppers Drug Mart Osoyoos presented a cheque for $6,235 to Desert Valley Hospice Society. The funds were raised through donations by customers between September and October under the drug store chain's Growing Women's Health program. Osoyoos Credit Union Community Giving Fund of $4,000 for Palliative Massage training in Nelson, BC. Pictured left to right: DVHS's Executive Director Donna Gordan, Vice-President Donna Kelso, President Lois Brummet and OCU General Manager Greg Sol. Russel Work of the Rotary Club of Oliver presents DVHS Executive Driector Donna Gordan with a cheque for $2,000; proceeds from the Rotary's 2018 Gala. The RCMP Regimental Ball chose Desert Valley Hospice Society as the beneficiary of their fall formal gala. Proceeds totalled an awesome $13,800. The cheque presentation was at the Supportive Care Centre with representatives from the Osoyoos RCMP Detachment, the RCMP Veteran's Association and DVHS Board Members. Larry Larson of the Oliver Kiwanis Club presents DVHS Executive Director Donna Gordan a cheque for $1,000 for the annual Hike for Hospice. At the May 2018 BCHPCA conference DVHS was awarded $7,500 for our Face-to-Face, The Social Way project by the Sovereign Order of St John. DVHS President Lois Brummet and Executive Director accepted the award at the conference luncheon.